Shounok was born and brought up in Kolkata. Did his post graduation from Delhi and then studied in FTII Pune, TV EDITING, 2004-2005. I come from an upper middle class Bengali family from Kolkata, so art and literature was always a part of growing up. Though watching films was a strict no, my parents always encouraged me to read a lot of storybooks and listen to Rabindra Sangeet and a lot of heavy classical music. My father being a lawyer and mother professor, there was always a pressure to put more stress on academics and education. As far as I recall, my introduction and early influences towards cinema, came from my grandmother, who would take me and my elder brother to watch films in theatre in afternoons, to kill time, as both my parents were working and it used to be an uphill task for her to manage us (I was very naughty as a kid). There used to be this theater in central Kolkata, called “Talkie Show House”, and that’s where she used to take us. Apart from that, as I was growing up, my elder brother used to sometimes take me to theatres and also he would talk about films, obviously all these in a very clandestine manner, ensuring that my parents would never have a clue. Naturally I started following him blindly -all his favorite films, film stars ,his idols, his favourite music, food and books and thus began my own journey through all of these. How did you first become interested in film editing? Initially I wanted to become a cinematographer, as I was fond of still photography. I started watching films and tried to get my hands on whatever film books were available. During this phase of my life on one side I had taken entrance exams for MBA and on the other side I had secretly, without my father’s knowledge applied to SRFTI, Kolkata, to pursue cinematography. I had cleared both the written tests but had to pursue my MBA degree. During my MBA days, I started reading more about films and found out this aspect of filmmaking called EDITING, which intrigued me. I began watching films with a different gaze and read more about this aspect. Thereafter I decided to study film editing and become an film editor. I was always a rebel, so after quitting my posh MBA job, against my parent’s will, I came back to my hometown, Kolkata from Delhi, and took up a job in a call centre. I worked throughout the night and during the day I would look out for any filmmaker, and try to assist or at least be associated with him/her. After two months, my health couldn’t sustain the day/night schedule, and I had to quit the BPO job, but to my surprise my parents finally understood my passion and gave in. I did my first ever filmmaking workshop after that and started training for the entrance exams of FTII, Pune. This was my second attempt. The first was during my final year of the MBA course. Had cleared the written and in the interview I was promised a seat next year if I would do a workshop on editing and then come back since at that time my interest was based only on theoretical knowledge. So I started all over again. Meanwhile, to my good fortune, I got in touch with a filmmaker called “Samiran Dutta”. 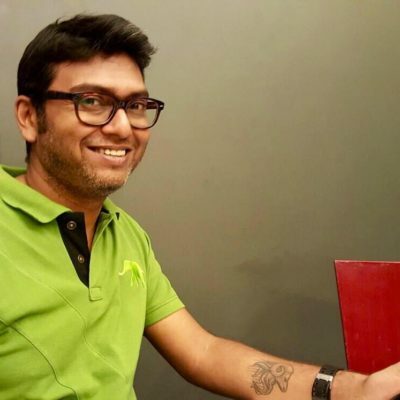 He had been the chief assistant director for the film “Meghe Dhaka Tara”, and it was through him that I learnt about my favourite director and my inspiration, “Ritwik Ghatak”. Those innumerable memorable evenings, sipping into coffee and listening to his anecdotes, and my formal training began and I wanted to study film editing in FTII, Pune. So it was workshops, watching and reading a lot of films and film books. Studying various aspects of filmmaking, art and culture, general history and books on cinema followed by interacting with the seniors of the film fraternity, FTII alumni and artists from related fields. That became my goal. I never assisted anyone, though I feel it’s an important process of learning. Well, I was editing a lot of documentary films, and adfilms and in-between them, I kept producing Television Shows. Deep within me, I always wanted to edit a feature film, but I never gave it a full hearted try, so one fine day a dear friend of mine (today he is one of the busiest DOPs in the country) asked me to give it a good shot. Apparently, I took his advice seriously, since we knew each other from our FTII days and within the next six months, I landed up with a full commercial hindi masala feature film. There was excitement at the beginning, but a lot of nervous energy was also flowing and I had to keep my focus intact. It was overwhelming but was stressful too. I would say that I had a mixed feeling about it. Watching films, listening to good music, and reading…everything around me basically. Its called life. Whenever I am reading a script or editing a scene, I try to simplify them by finding examples from daily life around me. So sometimes cutting into a close up or getting out of it and many such nuances of film editing becomes easy for me. So I guess I draw inspirations from daily life and use them as similes for my story telling though editing. Is film editing intuitive or is it something you learn? I think it’s a mix of both. The first pause button being pressed to stop the shot at a particular point in terms of length of the shot is absolutely intuitive and then it is followed by the other aspects of editing such as its grammar and rules. The editing table is where the culmination of a film happens. All departments culminate here, be it the camera movements or angles or the lighting, be it sound, art, properties and settings, the background, make up and costume, continuity, performance of the actors, their body language and dialogue delivery, almost everything that occurred in bits and pieces right from the film’s inception to its last day of shooting. The edit table is where you see all these bits and pieces being joined together, so learning will always help the intuition to become stronger. Like I said earlier, this is where the culmination of the film happens. Not only does the film takes its structure and shape, editing also instills oxygen into its soul, which was lifeless till now. So there is a huge amount of risk always prevailing around. An editor can make or break a film. Do you think the audience is perceptive about an edit? What kind of feedback do you get from non-film maker audience for your work? Perception of the audience is changing slowly. Though hardly about 10% of the audience is perceptive about editing, majority would equate it with just the joining of shots or if the film is lengthy or they feel if its stretched or ended quickly. But most of the audience perception is based on what they see, like direction, camera work, big sets, acting and music. Since good editing is supposed to be seamless, there lies an irony in itself. Film technology is continuously changing. Do you think it affects you as an editor, in the way you want to tell stories? Technology for me is an application through which we tell our stories, so its not a priority but it should not be ignored as well. I should know the workflow so well that technology should not be a hindrance to my creative thought process. To elaborate further, editors who are constantly upgrading themselves and are familiar with the continuous changing technology in filmmaking, have an edge over others who don’t. I like to upgrade myself all the time and love to read a lot about the technical nuances that are constantly evolving. Your favorite films or editors? At least two of them? There are many, but my all time favourite two would be Ajantrik and 400 Blows. In one or more ways I relate to them a lot with my sensibilities. My favourite editors would be Walter Murch, Thelma Schoonmaker, Renu Saluja and Sreekar Prasad. Any hurdles you have encountered in your journey. Things that are blocks in a achieving your vision while working on your film. There are innumerable. I am still striving to achieve a balance between my personal life and my profession. In retrospect, to sustain myself and my family I ended up editing small odd jobs and sometimes even producing bad content for television. Also one’s physical health matters a lot because of the amount of stress we go though while working on a film. Its always a hard bargain. Till date never heard anyone saying, budget is not a problem or there is a budget that will make you happy. Most of the time there’s an over-budget or there’s shoestring budget or no budget at all. Couple of films to edit and am also planning to direct. Have been writing for a while. Any advice to the inspiring editors? Keep working instead of waiting for the ideal project to happen. You learn from every project. Keep revisiting books and films and most importantly start thinking. Remember, editors with a directorial bent of mind and who are good at storytelling are preferred more. There have been mistakes, but as far as I can remember, till date I have been lucky enough not to commit any blunders professionally. To edit a Martin Scorsese feature film. Scarlet Johansson and Nargis Fakhri. A lot of retro English popular music from the 80s and 90s. Revisiting this book called “Cinema and I” by Ritwik Ghatak, and watched this Marathi film called “Sairat” in the theatres and almost finishing “Game of Thrones” S4 at home.